Here, we describe a chromatin immunoprecipitation (ChIP) and ChIP-seq library preparation protocol to generate global epigenomic profiles from low-abundance chicken embryonic samples. 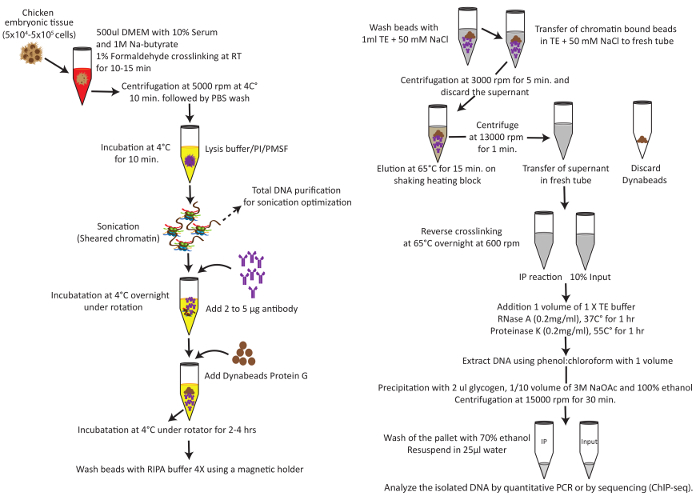 Rehimi, R., Bartusel, M., Solinas, F., Altmüller, J., Rada-Iglesias, A. Chromatin Immunoprecipitation (ChIP) Protocol for Low-abundance Embryonic Samples. J. Vis. Exp. (126), e56186, doi:10.3791/56186 (2017). Chromatin immunoprecipitation (ChIP) is a widely-used technique for mapping the localization of post-translationally modified histones, histone variants, transcription factors, or chromatin-modifying enzymes at a given locus or on a genome-wide scale. The combination of ChIP assays with next-generation sequencing (i.e., ChIP-Seq) is a powerful approach to globally uncover gene regulatory networks and to improve the functional annotation of genomes, especially of non-coding regulatory sequences. ChIP protocols normally require large amounts of cellular material, thus precluding the applicability of this method to investigating rare cell types or small tissue biopsies. In order to make the ChIP assay compatible with the amount of biological material that can typically be obtained in vivo during early vertebrate embryogenesis, we describe here a simplified ChIP protocol in which the number of steps required to complete the assay were reduced to minimize sample loss. This ChIP protocol has been successfully used to investigate different histone modifications in various embryonic chicken and adult mouse tissues using low to medium cell numbers (5 x 104 - 5 x 105 cells). Importantly, this protocol is compatible with ChIP-seq technology using standard library preparation methods, thus providing global epigenomic maps in highly relevant embryonic tissues. Histone post-translational modifications are directly involved in various chromatin-dependent processes, including transcription, replication and DNA repair1,2,3. Moreover, different histone modifications show positive (e.g., H3K4me3 and H3K27ac) or negative (e.g., H3K9me3 and H3K27me3) correlations with gene expression and can be broadly defined as activating or repressive histone marks, respectively2,3. Consequently, global histone modification maps, also referred to as epigenomic maps, have emerged as powerful and universal tools to functionally annotate vertebrate genomes4,5. For example, distal regulatory sequences such as enhancers can be identified based on the presence of specific chromatin signatures (e.g., active enhancers: H3K4me1 and H3K27ac), which distinguish them from proximal promoter regions (e.g., active promoters: H3K4me3)6,7,8. On the other hand, genes with major cell identity regulatory functions are typically found with broad chromatin domains marked with H3K4me3 or H3K27me3, depending on the transcriptionally active or inactive status of the underlying genes, respectively9,10. Similarly, the expression of major cell identity genes seems to be frequently controlled by multiple and spatially clustered enhancers (i.e., super-enhancers), which can be identified as broad H3K27ac-marked domains11. Currently, histone modification maps are generated using ChIP-seq technology, which in comparison to previous approaches such as ChIP-chip (ChIP coupled to microarrays) provides higher resolution, fewer artifacts, less noise, greater coverage, and lower costs12. Nevertheless, the generation of epigenomic maps using ChIP-seq technology has its inherent limitations, mostly associated with the capacity to successfully perform ChIP in the samples of interest. Traditional ChIP protocols typically required millions of cells, which limit the applicability of this method to in vitro cell lines or cells that can easily be isolated in vivo (e.g., blood cells). In the last few years, a number of modified ChIP protocols compatible with low cell numbers have been described13,14,15,16. However, these protocols are specifically designed to be coupled with next-generation sequencing (i.e., ChIP-seq), and they typically use ad hoc library preparation methods13,14,15,16. Here, we described a ChIP protocol that can be used to investigate histone modification profiles using low to intermediate cell numbers (5 x 104 - 5 x 105 cells) at either selected loci (i.e., ChIP-qPCR) or globally (i.e., ChIP-seq) (Figure 1). When coupled to ChIP-seq technology, our ChIP protocol can be used together with standard library preparation methods, thus making it broadly accessible to many laboratories10. This protocol has been used to investigate several histone marks (e.g., H3K4me3, H3K27me3, and H3K27ac) in different chicken embryonic tissues (e.g., spinal neural tube (SNT), frontonasal prominences, and epiblast). However, we anticipate that it should be broadly applicable to other organisms in which biologically and/or clinically relevant samples can be only obtained in low amounts. According to German animal care guidelines, no Institutional Animal Care and Use Committee (IACUC) approval was necessary to perform the chicken embryo experiments. According to the local guidelines, only experiments with chicken HH44 (18-day) embryos and older require IACUC approval. However, the embryos used in this study were all in earlier stages of embryonic development (i.e., HH19 (72 h)). NOTE: The purpose of this protocol is to provide a detailed description of the ChIP assay so it can be effectively combined with qPCR or next-generation sequencing (i.e., ChIP-seq) to investigate histone modifications in low-abundance embryonic samples (ranging from 5 x 104 - 5 x 105 cells for each ChIP reaction) and different tissue types (Figure 1). The protocol should be applicable to investigating the binding profiles of transcription factors and co-activators (e.g., p300). However, due to the lower abundance of these regulatory proteins, larger cell numbers are likely to be required (5 x 105 - 5 x 106 cells for each ChIP reaction). NOTE: The procedure for microdissections technically differs from tissue to tissue and from animal model to animal model. This section describes in detail the dissection protocol used to obtain brachial SNT sections from stage-HH19 chicken embryos as an example. Incubate fertile white leghorn hen eggs, obtained from a local breeder, in horizontal orientation at 37 °C and 80% humidity for 3 days to get stage-HH19 chicken embryos. Determine the stages according to the Hamburger and Hamilton chicken embryonic developmental staging system17. Perform all microdissections under cold conditions; otherwise, chromatin integrity could be compromised. To make the embryos accessible, extract 3 mL of albumin using a 10-mL syringe with a needle (0.90 x 40 mm) to lower the blastoderm. Make a small opening in the egg using fine scissors and add 1 mL of Locke solution (see the Supplementary Materials for the recipe) to facilitate the removal of extra-embryonic membranes. Inject 10% Indian black ink/Locke solution by using a 1-mL syringe with a needle (0.55 x 25 mm2) under the blastoderm to make the visualization of the embryos easier. Cut off the extra-embryonic membrane that surrounds the embryo using medical surgical fine scissors and forceps. Use a perforated spoon to transfer the embryo to a 4.5 cm Petri dish containing 20 mL of 1x PBS solution. Dissect away the amnion and the remaining parts of extra-embryonic membrane using fine scissor and forceps under a stereomicroscope. Cut the transverse SNT segment at the brachial level of the embryo, extending caudally into the thoracic region to isolate the SNT (Figure 2). Remove tissues that laterally/ventrally surround the SNT (e.g., lateral plate mesoderm, ectoderm, notochord, and aorta) using forceps (Figure 2). Immerse each dissected chicken SNT segment in a 3.5 cm Petri dish containing 5 mL of warm (37 °C) trypsin (Trypsin/EDTA solution 1:250). Stop the trypsin treatment when loosening of the non-neural tissues around the SNT is detected under a stereomicroscope. NOTE: The trypsinization time must be tightly controlled to avoid the over-digestion and dispersion of neural tissue and to retain the structural integrity of the SNT. After trypsin treatment, remove the remaining mesenchymal and ectodermal tissues manually to prepare the clean SNT section. Transfer the SNT section to a 1.5 mL tube and flash-freeze it in liquid nitrogen. Once sufficient SNT sections are accumulated (pool the SNT sections from ~30 chicken embryos for one ChIP reaction), store at -80 °C. NOTE: If sufficient embryonic tissue (i.e., 5 x 105 - 5 x 106 cells) can be dissected from a single or a few chicken embryos, then freezing is not necessary and it is possible to proceed directly to the next steps. Please refer to the troubleshooting guide in Table 1. NOTE: Caution! Liquid nitrogen has an extremely low temperature, wear appropriate protection. NOTE: Perform all steps on ice unless stated otherwise. Add 500 µL of DMEM with 10% FBS and 10 µL of 1 M Na-butyrate directly to the frozen tissue or, alternatively, immediately to the freshly dissected tissue. Homogenize the cells by re-suspending gently with a 1 mL pipette. NOTE: The addition of Na-butyrate is optional but recommended if investigating histone acetylation. Instead of DMEM-10% FBS, samples can be resuspended in 1x PBS with 0.1% BSA. The addition of FBS or BSA is optional, but it facilitates pelleting the samples in the subsequent centrifugation steps. Add 13.5 µL of 37% formaldehyde (1% formaldehyde final) and place it on a rotator for 15 min at room temperature. NOTE: Caution! Formaldehyde is toxic. Add 25 µL of 2.5 M glycine to the tube and place it on a rotator for 10 min at room temperature to quench the formaldehyde. Spin the tube at 850 x g for 5 min at 4 °C in a table-top centrifuge. Discard the supernatant. Wash the pellet once with 500 µL of cold freshly prepared wash buffer (see the Supplementary Materials for the recipe), centrifuge at 850 x g and 4 °C for 5 min, and discard the supernatant. Prepare complete lysis buffer (LB) (see the Supplementary Materials for the recipe) and chill on ice. For 1 mL, use 950 µL of LB, 40 µL of protease inhibitor concentrate (25x), and 10 µL of 100% PMSF. Resuspend the pellet in 300 µL of complete LB by pipetting and place it on a rocking platform for 10 min at 4 °C. NOTE: Sonication conditions need to be optimized for each tissue and will vary depending on the sonicator used. It is recommended to use the lowest sonication settings that result in sheared DNA ranging from 200 to 600 bp in size. Shearing varies greatly depending on tissue type, quantity, sonication volume, crosslinking conditions, and equipment. Please refer to the troubleshooting guide in Table 1. Spin the sonicated sample at 16,000 x g for 10 min at 4 °C to pellet the cellular debris. Transfer the lysate (supernatant) to a fresh 1.5-mL tube. NOTE: If the starting material is deemed sufficient for two ChIP experiments, then 300 µL of complete LB can be added to the sonicated chromatin (i.e., final volume: 600 µL). Add 30 µL of 10% octylphenol ethoxylate for every 300 µL of sonicated lysate (final concentration: 1%) and mix by pipetting. NOTE: Caution! Octylphenol ethoxylate is acutely toxic (oral, dermal, inhalation). Aliquot the 330 µL of sonicated lysate into two 1.5-mL tubes: 300 µL for ChIP and 30 µL as the input control (10% of the starting material). Store the "30 µL input control sample" at -20 °C. NOTE: If two ChIP reactions are performed from the same sample, then the 660 µL of sonicated lysate can be distributed into three 1.5 mL tubes (300 µL for ChIP#1, 300 µL for ChIP#2, and 60 µL as input control (20% of the starting material of each ChIP)). Add 3 - 5 µg of antibody to the 300 µL of sonicated chromatin aliquot and invert to mix. NOTE: In this study, each ChIP reaction was performed with an antibody specific for Histone H3 tri methylated at K4 (H3K4me3), Histone H3 di methylated at K4 (H3K4me2), Histone H3 tri methylated at K27 (H3K27me3), and Histone H3 tri acetylation at K27 (H3K27me3). The success of this protocol is entirely dependent on the quality of the antibody used. The antibody should be specific and efficient at the immunoprecipitation of a specific protein. It is important to determine the amount of antibody that can be used to immunoprecipitate the crosslinked protein-DNA complex. Also, the specificity of the antibody can be checked by Western blot to ensure that it detects the correct protein. An antibody that detects multiple nonspecific bands is not recommended for ChIP. Place the tube on a rocking platform at 4 °C overnight (12 - 16 h) to bind the antibody to the chromatin. NOTE: Please refer to the troubleshooting guide in Table 1. Aliquot 50 - 100 µL of Protein G/magnetic bead slurry for each ChIP reaction into a 1.5 mL microfuge tube on ice. Wash the magnetic beads three times with cold block solution (see the Supplementary Materials for the recipe) (4 °C). Add 500 µL of cold block solution and mix by inverting or flicking. Put the tube into a magnetic holder and wait for the beads to settle on the side of the tube. Pour off the clear liquid and repeat. After the last wash, remove all liquid with a gel-loading tip. Add the 300 µL of antibody-bound chromatin to the washed beads and invert to mix. Rotate vertically on a tube rotator at 4 °C for at least 4 h to bind the antibody to the beads. Chill RIPA Wash Buffer (see the Supplementary Materials for the recipe) on ice, set the water bath to 65 °C, and precool the centrifuge to 4 °C. Wash the chromatin-bound beads four times in 1 mL of cold RIPA Wash Buffer and keep on ice. To do so, add 1 mL of cold RIPA Wash Buffer and mix by inverting or flicking. Place the tube into the magnetic holder and wait for the beads to settle on the side of the tube. Pour off the clear liquid and repeat. NOTE: The number of washes with RIPA Wash Buffer might need to be optimized depending of the sample type, sample abundance, and antibody being used. An increased number of washes will diminish the background but will also decrease the total amount of recovered DNA, which can compromise downstream analysis by qPCR or ChIP-seq. Add 1 mL of TE/50 mM NaCl to the tube and transfer the chromatin-bound beads in TE/50 mM NaCl to a fresh 1.5-mL microfuge tube before removing the liquid by using the magnetic holder, as described above. Spin the beads at 900 x g for 3 min at 4 °C, place the tube back into the magnetic holder, and remove all remaining TE with a gel-loading tip. Add 210 µL of elution buffer (see the Supplementary Materials for the recipe) at room temperature and resuspend by flicking. Elute for 15 min at 65 °C in a heat block while shaking. Spin the beads at 16,000 x g for 1 min at room temperature and place the tube into the magnetic holder. Transfer the supernatant (~200 µL) to a fresh microfuge tube once the beads have settled. Thaw the input control samples (30 µL) from -20 °C to room temperature (frozen in step 4.1), add 3 volumes of elution buffer (90 µL), and mix by briefly vortexing. Incubate the chip and control samples at 65 °C overnight (12 - 16 h) to reverse the crosslinks. 8.1At room temperature, add 1 volume of TE buffer per tube (to dilute the SDS) and invert to mix: add 120 µL of TE to 120 µL of control sample and 200 µL of TE to 200 µL of the ChIP sample. Add RNase A to a 0.2 mg/mL final concentration and invert to mix: add 2.4 µL of 20 mg/mL RNase A to 240 µL of control sample and 4 µL of 20 mg/mL RNase A to 400 µL of the ChIP sample. Incubate the tubes at 37 °C in a water bath for 2 h to digest the RNA. Add Proteinase K to a final concentration of 0.2 mg/mL and invert to mix: add 2.4 µL of 20 mg/mL Proteinase K to 240 µL of control sample and 4 µL of 20 mg/mL Proteinase K to 400 µL of the ChIP sample. Incubate at 55 °C in a water bath for 2 h to digest the protein and purify the DNA. NOTE: Perform DNA extraction and purification, as described in the Supplementary Materials. 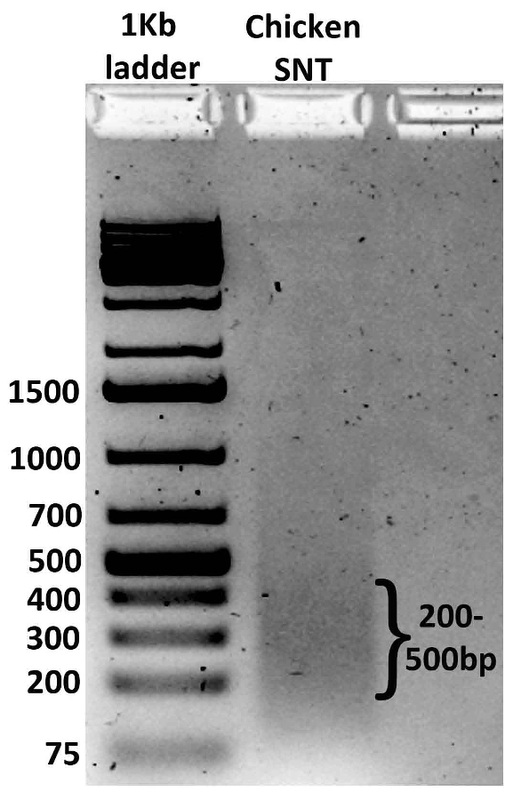 NOTE: Verify sonication efficiency as described in the Supplementary Materials, to confirm that 200- to 500-bp DNA fragments are obtained (Figure 3). NOTE: A critical step is to determine if the ChIP actually worked. If there are known genomic binding sites for the protein of interest, primers can be designed for quantitative PCR (qPCR) to determine if the known sites are specifically enriched in the ChIP DNA, in comparison with negative-control regions not expected to be bound by the candidate proteins. As an example, this work shows the ChIP-qPCR results obtained with ChIPs performed for H3K4me3 (active promoter histone mark) and H3K27me3 (inactive promoter histone mark) in SNT sections isolated from HH14 chick embryos ( Figure 4A). Mix each primer pair (forward and reverse) in the same tube and prepare a stock concentration at 20 µM each using dH2O (Table 2). NOTE: the efficiency of each primer pair should be evaluated before ChIP-qPCR analysis. Use the ChIP and 20% input control DNA obtained in step 8.5 for qPCR optimization. NOTE: The input DNA is typically diluted 20x (to 1% of the starting material used in the ChIP reactions) for qPCR analysis. For each 10 µL of PCR, mix the following components in a PCR tube: for DNA mastermix, add 2 µL of dH2O, 2.5 µL of SYBR green mix, and 1 µL of DNA (from ChIP or 1% input); for mastermix with primers, add 2.375 µL of dH2O, 2.5 µL of SYBR green mix, and 0.125 µL of forward and reverse primer mix. Mix the samples by vortexing for 2 s and briefly centrifuge at 900 x g for 1 min. Perform real-time PCR (an example of primers and cycling conditions used here can be found in Table 2 and Table 3, respectively). Dilute up to 100 ng of ChIP-DNA in 60 µL of elution buffer (see the Materials Table). Add 40 μL of end repair mix and pipette gently 10 times. Incubate at 30 °C for 30 min on a thermal cycler. Vortex the magnetic beads and add 160 μL to the tube containing the end repair mix. Mix thoroughly by pipetting 10 times. Incubate 15 min at room temperature . Place the tube into the magnetic holder and wait for the beads to settle on the side of the tube..
Pour off the clear liquid. While keeping the tube on the magnetic holder, add 200 μL of freshly prepared 80% EtOH. Incubate at room temperature for 30 s and discard the supernatant. Repeat once..
Keep the tube for 15 min on the magnetic holder at room temperature. Once the pellet is dry, remove the tube from the magnetic holder. Resuspend the pellet in 20 μL of resuspension buffer. Gently pipette 10 times to mix thoroughly. Place the tube into the magnetic holder and wait for the beads to settle on the side of the tube . Transfer 17.5 μL of the supernatant to a new tube. Add 2.5 μL of resuspension buffer, 2.5 μL of ligation mix and 2.5 μL of the appropriate RNA adapter index. Mix thoroughly by gently pipetting up and down 10 times. Incubate on a thermal cycler for 10 min at 30 °. Add 5 μL of stop ligation buffer and mix thoroughly by pipetting 10 times. Vortex the magnetic beads and add 42.5 μL to the sample. Mix thoroughly by pipetting 10 times. Incubate 15 min at room temperature. Incubate at room temperature for 30 s and discard the supernatant. Repeat once. Keep the tube on the magnetic holder and, let the sample air-dry for 15 min.. Remove the tube from the magnetic holder and resuspend the pellet in 52.5 μL of resuspension buffer. Mix thoroughly by pipetting 10 times. Incubate at room temperature for 2 min, place the tube into the magnetic holder and wait for the beads to settle on the side of the tube. Transfer 50 μL of the clear supernatant to a new tube. Vortex the magnetic beads and add 50 μL to the sample. Mix thoroughly by pipetting 10 times. Incubate 15 min at room temperature. Place the tube into the magnetic holder and wait for the beads to settle on the side of the tube and pour off the clear liquid. Keep the tube on the magnetic holder and, let the sample air dry for 15 min. Remove the tube from the magnetic holder and resuspend the pellet in 27.5 μL of resuspension buffer. Mix thoroughly by pipetting 10 times. Incubate at room temperature for 2 min, place the tube into the magnetic holder and wait for the beads to settle on the side of the tube. Transfer 25 μL of the clear supernatant to a new tube. Place 12.5 µL of the template in a 0.2 mL PCR tube. Add 2.5 μL of PCR primer cocktail, 10 μL of enhanced PCR mix. Mix thoroughly by pipetting up and down 10 times. Place the tube on a thermal cycler and use the conditions described in Table 4. Vortex the magnetic beads and add 25 μL to the sample. Mix thoroughly by pipetting 10 times. Incubate 15 min at room temperature. Place the tube into the magnetic holder, wait for the beads to settle on the side of the tube and pour off the clear liquid. While keeping the tube on the magnetic holder, add 200 μL of freshly prepared 80% EtOH. Incubate at room temperature for 30 s and discard the supernatant. Repeat once. Keep the tube on the magnetic holder and, let the sample air dry for 15 min. Remove the tube from the magnetic holder and resuspend the pellet in 32.5 μL of resuspension buffer. Mix thoroughly by pipetting 10 times. Incubate the PCR tube/plate for 2 min at room temperature. Place the PCR tube/plate on the magnetic stand at room temperature, wait for the beads to settle on the side of the tube and transfer 30 μL of the supernatant to a new tube. NOTE: The validation of the library is performed using a DNA and RNA quality-control system. Preparation of the ladder: aliquot 1 µL of genomic DNA Ladder into the first tube/well and add 3 µL of sample buffer. Preparation of the sample: mix 1 µL of the library sample (10 - 100 ng/µL) with 3 µL of sample buffer in a tube. Spin down and then vortex on maximum speed for 5 s. Spin down to position the sample at the bottom of the tube. Load the samples into the quality-control system. Once the run is complete, analyze the results by setting the contrast at the maximum value to make sure no primer dimers are present in the sample (Figure 5); primer dimers should correspond at a band around 135 bp. If even a weak band is present, proceed to a second clean-up by adding elution buffer (see the Materials Table) up to a 50 µL volume and add 47.5 µL of the mixed magnetic beads. If the concentration of the sample is too low (<2 nM), proceed to run the PCR (step 13.1), using 18 cycles instead of 15, with the 12.5-µL volume of sample left from step 12.16. Quantify the libraries individually by qPCR using commercially available kits. NOTE: Pools of libraries can be sequenced using a sequencer with a single-read of 1 x 50 nt protocol aiming at 30 M reads/sample. To illustrate the performance of our ChIP protocol, we performed ChIP-seq experiments using pooled SNT sections from HH19 chicken embryos, maxillary prominences of HH22 chicken embryos, and stage-HH3 chicken embryos to investigate the binding profiles of various histone modifications (i.e., H3K4me2, H3K27ac, H3K4me3, and H3K27me3). Once ChIP DNAs were obtained, the sonication efficiency was evaluated by agarose gel electrophoresis of the corresponding input DNAs (Figure 3). Then, the ChIP and input DNAs were used for ChIP-qPCR analysis to measure the enrichments at loci expected to be either bound or unbound by the investigated histone modifications (Figure 4A). In the example shown in Figure 4A, H3K27me3 and H3K4me3 enrichment levels in HH19 SNT sections were evaluated by ChIP-qPCR around the promoter regions of SOX17 and SOX2, two genes that are inactive and active in the SNT, respectively. As expected, the SOX2 promoter was strongly marked by H3K4me3 but not by H3K27me3, while the SOX17 promoter showed the opposite pattern (Figure 4A). By evaluating a few loci, it is possible to estimate the quality of the ChIP without losing much DNA material for downstream ChIP-seq analysis. Once the quality of the ChIPs was confirmed, ChIP-seq libraries were prepared and sequenced. 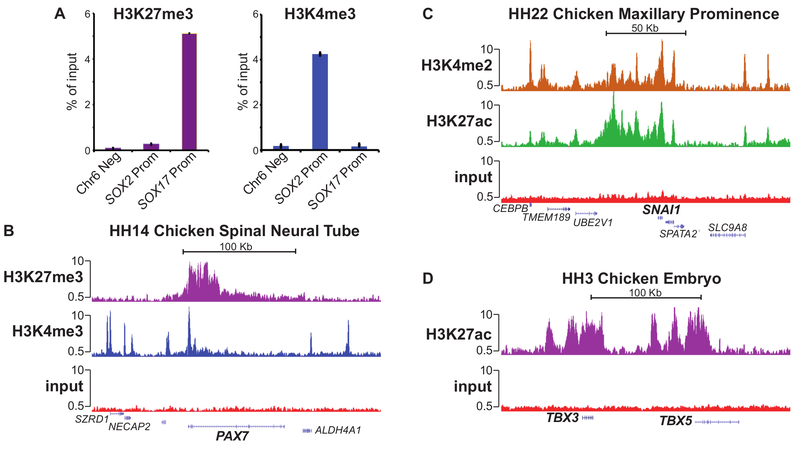 Representative loci are shown for each of the investigated chicken embryonic tissues: (i) profiles for H3K27me3 and H3K4me3 in the SNT of HH19 chick embryos around PAX7 (Figure 4B); (ii) profiles for H3K4me2 and H3K27ac in the maxillary prominences of HH22 chicken embryos around SNAI1 (Figure 4C); and (iii) profile for H3K27me3 in HH3-stage chicken embryos around the TBX3/TBX5 locus (Figure 4D). These ChIP-seq experiments clearly illustrate that our ChIP protocol can be used to generate epigenomic profiles from limited amounts of biological material in a broad range of embryonic tissues. Figure 1: Schematic Overview of ChIP Protocol for Low-abundance Embryonic Samples Isolated from Chicken Embryos. Please click here to view a larger version of this figure. Figure 2: Brief Overview of the SNT Microdissection Protocol. 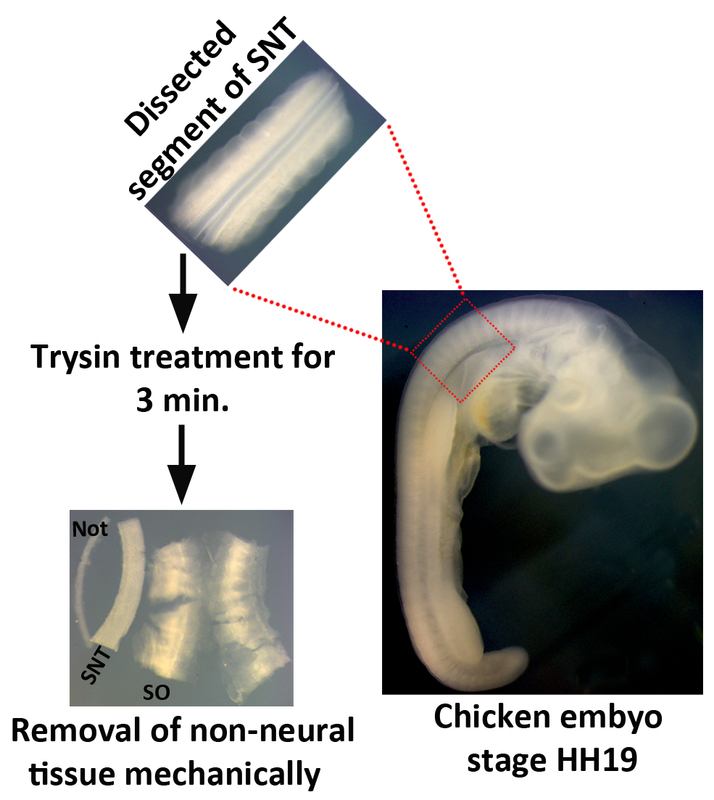 The transverse SNT segment is cut off at the brachial level of an HH19 chicken embryo. After trypsin treatment, the non-neural tissue is removed mechanically using forceps. Not, notochord; SNT, spinal neural tube; and SO, somite. Please click here to view a larger version of this figure. Figure 3: Example of Optimal Sonication. A chicken SNT HH19 sample was sonicated for 11 cycles, with 30 s ON and 45 s OFF pulses at "high" amplitude using a sonicator. The crosslinks were reversed and the purified DNA was resolved on a 1.5% agarose gel. The optimal fragment size is observed after 11 cycles, ranging from 200 - 500 bp. Please click here to view a larger version of this figure. Figure 4: Representative Examples of ChIP Analysis by ChIP-qPCR or ChIP-seq. (A) H3K27me3 (left) and H3K4me3 (right) levels at the indicated regions were measured by ChIP-qPCR analysis performed using SNT sections isolated from HH19 chick embryos. The SOX2 promoter region is active in the SNT and is thus marked by H3K4me3 but not by H3K27me3; the SOX17 promoter region is inactive in the SNT and is therefore enriched in H3K27me3 but not in H3K4me3; Chr6 Neg represents an intergenic region in chicken chromosome 6 and serves as a negative control. Error bars represent the standard deviation from three technical replicates. (B) ChIP-seq (H3K27me3 in magenta, H3K4me3 in blue, and input in red) profiles from the SNTs of HH14 chick embryos are shown around the PAX7 locus. (C) ChIP-seq (H3K4me2 in orange, H3K27ac in green, and input in red) profiles from the maxillary prominences of HH22 chick embryos are shown around the SNAI1 locus. (D) ChIP-seq (H3K27me3 in magenta and input in red) profiles from HH3 chick embryos are shown around the TBX3/TBX5 locus. Please click here to view a larger version of this figure. 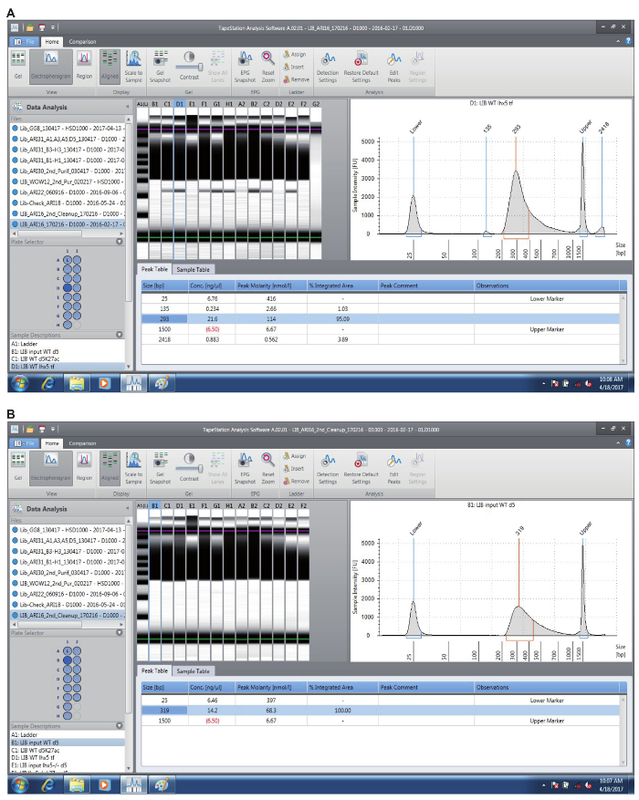 Figure 5: Example of ChIP-seq Library Validation using the Automated RNA Quality-control System. The same ChIP-seq libraries were analyzed with the automated RNA quality-control system before (A) and after (B) primer dimer cleanup. Primer dimers can be seen as a weak ~135 bp band in (A). Please click here to view a larger version of this figure. 1,2,3,4 5 and 11 Low ChIP signal to noise ratios according to ChIP-qPCR and/or ChIP-seq Tissue quality compromised. Perform micro-dissections in cold conditions; otherwise chromatin integrity could be compromised. Sample loss after centrifugation of crosslinked samples. Use DMEM medium with 10 - 20% serum or repeat centrifugation step and increase time to 10 min. Cross-linking duration. Optimize the crosslinking time. Increased crosslinking times can facilitate the detection of certain proteins, such as co-activators and co-repressors that do not bind to DNA directly. Sample loss due to multiple washes in PBS. Reduce the number of washes ; centrifugation steps can be repeated at 1,500 x g.
Antibody not suitable for ChIP. Use a different antibody against the endogenous protein or an antibody against a tag added to an exogenously expressed proteins (e.g. Flag, HA). 12 Low or no signals in qPCR, even for input DNA Suboptimal primers Check the primer efficiency and specificity; design new primers. Insufficient amount of DNA Not enough starting material. Increase the amount of DNA used per qPCR reaction. Table 1: Troubleshooting Guide for Various Steps Involved in the Protocol. Table 2: Primer Sequences for ChIP-qPCR. Table 3: PCR Conditions for ChIP-qPCR. Table 4: PCR Conditions for Amplification of DNA Fragments during ChIP-seq Library Preparation. Epigenomic profiling of histone modification using ChIP-seq can be used to improve the functional annotation of vertebrate genomes in different cellular contexts4,5,18. These epigenomic profiles can be used, among other things, to identify enhancer elements, to define the regulatory state of enhancers (i.e., active, primed, or poised), and to define major cell identity regulators in different biological or pathological contexts (e.g., broad H3K4me3 promoter domains and super-enhancers)6,7,9,10,11,19. However, due to the inherent limitation of the ChIP assay, which typically requires millions of cells, most histone modification profiles have been generated in in vitro cell lines and cell types that can be sorted in vivo in large quantities4. Most recently, several ChIP-seq protocols have been described that are compatible with extremely low cell numbers, thus dramatically expanding the range of cell types and tissues in which epigenomic profiles can, in principle, be generated13,14,15,16. These new ChIP-seq protocols each rely on specific ad hoc library preparation methods that, at least in some cases, require non-standard equipment and/or reagents14,15,16. Here, we describe a ChIP protocol that works with low to intermediate cell numbers (5 x 104 - 5 x 105 cells) obtained in vivo from different embryonic tissues10. To increase the sensitivity of our ChIP assays, we have eliminated several steps normally used during ChIP, such as sequential cell and nuclear lysis, which can result in a progressive loss of valuable material. Thus, after crosslinking, samples are treated with a single lysis buffer and are subsequently sonicated to minimize sample loss. Importantly, our ChIP protocol is compatible with qPCR analysis, thus enabling the epigenomic analysis of selected loci of interest. Furthermore, our ChIP protocol can be combined with standard ChIP-seq library preparation methods, thus being potentially useful to most laboratories with access to next-generation sequencing technology. ChIP and ChIP-seq protocols can be used not only to investigate the binding profiles of histone modifications but also to uncover the binding sites of other important transcriptional regulators, such as transcription factors and co-activators (e.g., p300 and CBP)20. Typically, ChIPs (and ChIP-seq) for transcription factors and co-activators, which are not as abundant as histones, require considerably more starting material than ChIPs for histone marks. Thus, the described protocol might not necessarily work for most transcription factors or co-activators unless the number of starting cells is considerably increased (e.g., 5 x 105 - 5 x 106 cells) and/or highly specific and efficient antibodies are available. Nevertheless, with further optimization and the constantly improving library preparation methods, we anticipate that ChIP-seq from limited cellular material will become feasible for most regulatory proteins. Although our ChIP and ChIP-seq protocols have been extensively validated for a variety of histone modifications and embryonic tissues, we would like to highlight some critical steps that we consider essential to generating high-quality epigenomic profiles. First, the embryonic samples need to be freshly isolated under conditions that do not compromise chromatin integrity. These include performing dissections under cold conditions or flash-freezing pooled samples until sufficient material is accumulated. Another critical step is sonication, which needs to be accurately optimized to perform high-quality ChIPs. Optimal sonication conditions frequently vary, depending on the tissue type, the amount of tissue, or the sonicator being used. Last but not least, a successful ChIP ultimately relies on the availability of specific and ChIP-compatible antibodies against the proteins of interest. The authors do not have any competing financial interests to be disclosed. The authors thank Jan Appel for his excellent technical assistance during the establishment of this protocol. Work in the Rada-Iglesias laboratory is supported by CMMC intramural funding, DFG Research Grants (RA 2547/1-1, RA 2547/2-1, and TE 1007/3-1), the UoC Advanced Researcher Group Grant, and the CECAD Grant. Jenuwein, T., Allis, C. D. Translating the histone code. Science. 293, (5532), 1074-1080 (2001). Wang, Z., Schones, D. E., Zhao, K. Characterization of human epigenomes. Curr Opin. Genet Dev. 19, (2), 127-134 (2009). ENCODE Project Consortium. An integrated encyclopedia of DNA elements in the human genome. Nature. 489, (7414), 57-74 (2012). Roadmap Epigenomics Consortium. Integrative analysis of 111 reference human epigenomes. Nature. 518, (7539), 317-330 (2015). Rada-Iglesias, A., Bajpai, R., Swigut, T., Brugmann, S. A., Flynn, R. A., Wysocka, J. A unique chromatin signature uncovers early developmental enhancers in humans. Nature. 470, (7333), 279-283 (2011). Creyghton, M. P., et al. Histone H3K27ac separates active from poised enhancers and predicts developmental state. Proc Nat Acad Sci USA. 107, (50), 21931-21936 (2010). Benayoun, B. A., et al. H3K4me3 breadth is linked to cell identity and transcriptional consistency. Cell. 158, (3), 673-688 (2014). Rehimi, R., et al. Epigenomics-Based Identification of Major Cell Identity Regulators within Heterogeneous Cell Populations. Cell Rep. 17, (11), 3062-3076 (2016). Valouev, A., et al. Genome-wide analysis of transcription factor binding sites based on ChIP-Seq data. Nat Methods. 5, (9), 829-834 (2008). Dahl, J. A., et al. Broad histone H3K4me3 domains in mouse oocytes modulate maternal-to-zygotic transition. Nature. 537, (7621), 548-552 (2016). Rotem, A., et al. Single-cell ChIP-seq reveals cell subpopulations defined by chromatin state. Nat Biotech. 33, (11), 1165-1172 (2015). Schmidl, C., Rendeiro, A. F., Sheffield, N. C., Bock, C. ChIPmentation: fast, robust, low-input ChIP-seq for histones and transcription factors. Nat Methods. 12, (10), 963-965 (2015). Zhang, B., et al. Allelic reprogramming of the histone modification H3K4me3 in early mammalian development. Nature. 537, (7621), 553-557 (2016). Hamburger, V., Hamilton, H. L. A series of normal stages in the development of the chick embryo. Dev Dynam. 195, (4), 231-272 (1951). Ho, J. W. K., et al. Comparative analysis of metazoan chromatin organization. Nature. 512, (7515), 449-452 (2014). Calo, E., Wysocka, J. Modification of enhancer chromatin: what, how, and why? Mol Cell. 49, (5), 825-837 (2013). Spitz, F., Furlong, E. E. M. Transcription factors: from enhancer binding to developmental control. Nat Rev Genetics. 13, (9), 613-626 (2012).